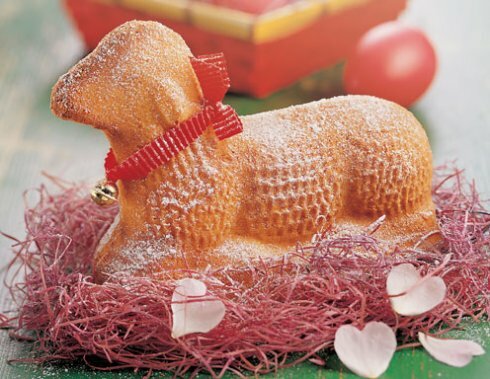 The Easter Lamb is a family tradition back home, I guess not just with my family but with many German families. Wilton has the “Stand-Up Lamb Pan Set” and I found that one at the Bulk Barn just before Easter. I think it was like 20 or 30 CAN dollars so I didn’t mind and I knew I would use it over the years. The set comes with instructions and several recipes for butter cream and such. However, they don’t give you a recipe for the batter. So I looked through my books and here is a recipe for white cake from the “Recipes for young adults” that my husband got when he was in high school (he was forced to take that class). Mix all dry ingredients. Then mix butter with sugar until creamy, add vanilla. Add the egg and beat until you have a nice light dough. Add liquid and dry ingredients alternating to the butter/egg mix until all is well combined. Grease your form and dust with flour. I think I made a double batch for the lamb form because it is pretty big. The batter goes into the front half of the lamb up to the rim. Then place back half on and thigh both together. Bake in 160°C preheated oven for 1 hour. 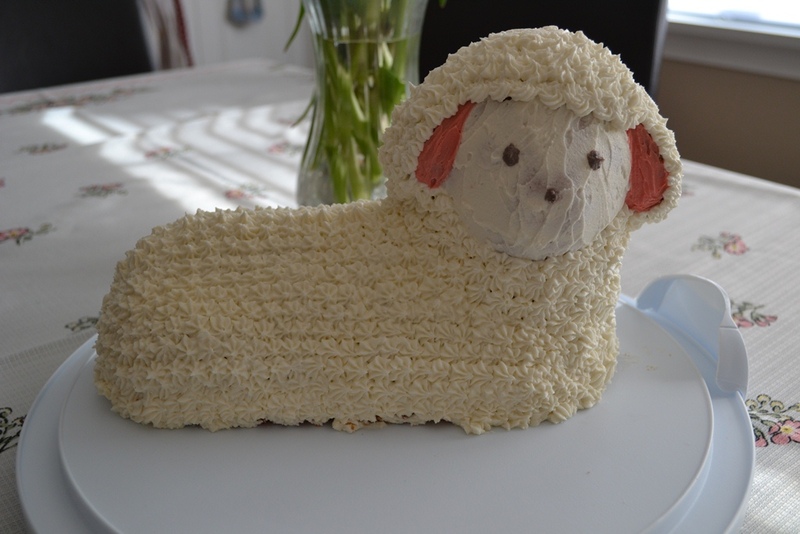 I used the Wilton butter creme to decorate the lamb. It seems the reasonable thing to do, making sure there is enough. Posted in Cake, Holiday and tagged baking, holidays, recipe, sheep. Bookmark the permalink.